So, something I’ve wanted to do before I go off on my Trail adventure is to get an idea of what it is like to be behind a team of sixteen dogs. 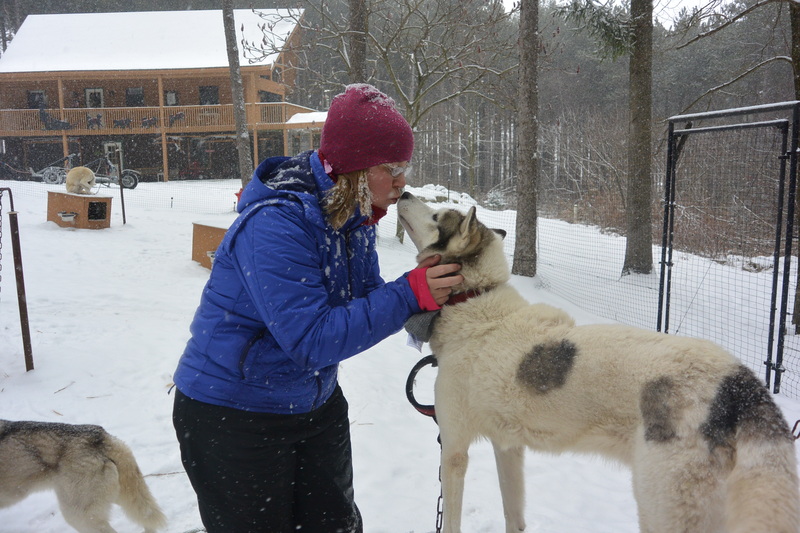 I contacted my friends at Husky Powered Dog Sledding in Western Maryland (http://www.huskypowerdogsledding.com/) and arranged to go play “musher” for a couple of days! And what a wonderful experience I had! When I arrived at the kennel in the afternoon of day one, I got settled and then went out to “snack” the dogs. They have about eighteen huskies or so in their kennel. Sarah, the handler, and I went about and visited each dog and gave them a treat. What a great way to say hello! Then we were ready to harness up the team. This is where things got interesting. First we went through the yard and put harnesses on the dogs who were going out on the run. As soon as the dogs saw the harnesses, they started going nuts! They were barking and jumping and ready to go, go, go! After the dogs had their harnesses on we started taking them out and attaching them to the gang line. 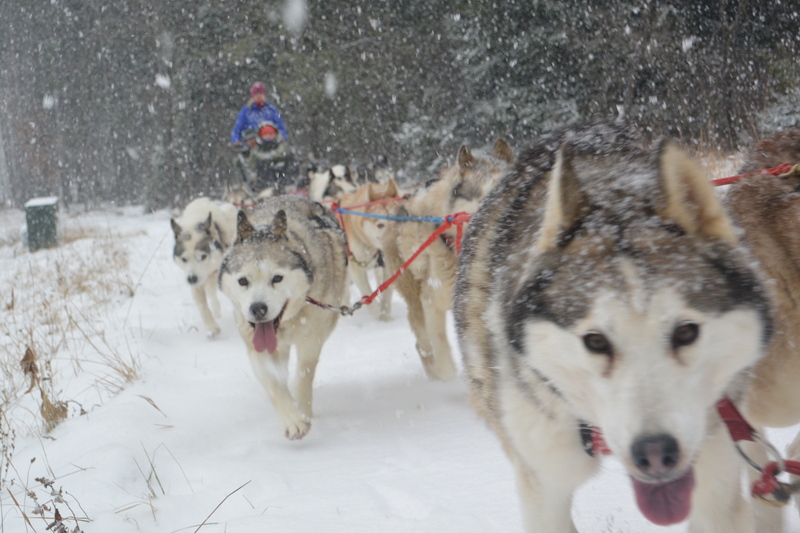 They get clipped in at two places, the tug line and the neck line, but they only pull the sled by the tug line. The neckline is used just to help keep them in place correctly, and not all mushers choose to use them. Once there were about five dogs on the line, my direction was to sit in the cart as my weight was needed to help keep the dogs from pulling the cart loose and taking off too early! Once all thirteen dogs were in place, we took off! Sarah and I were riding in the cart and Mike was standing in the rear. After a few minutes, my big moment came! Mike hopped into my seat, and I stood on the runners. I gave the “Ready? Hike!” command and we were off down the trail with me in command! I was almost overwhelmed by how much there was to think of, watch, and pay attention to at one time! I had to think about the cart. Because there wasn’t that much snow yet, we used a wheeled cart on the trails. But, because it had been snowing for several hours, it was very slick and slippery. 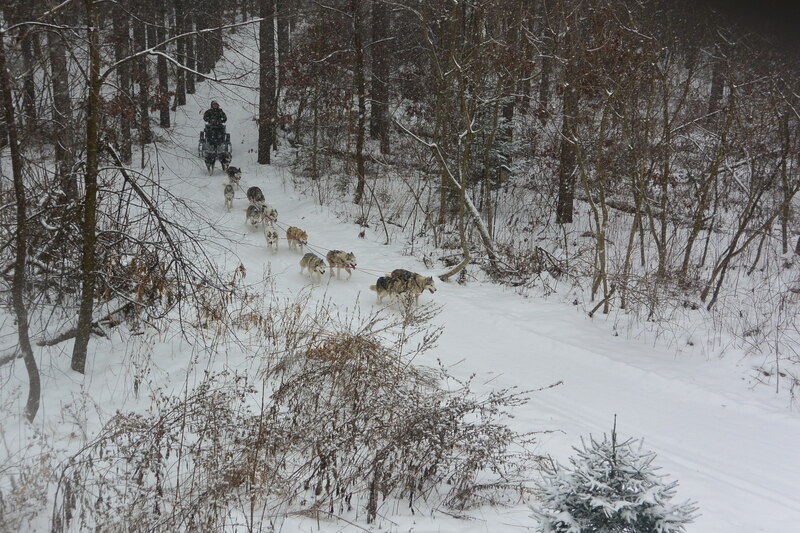 I had to try to keep the cart on the high side of the trail and keep the right amount of pressure on the brakes to keep the dogs at the proper pace. I had to watch all of the dogs and all of the lines to make sure everything was working smoothly. I had to be sure to call out the “Gee!” and “Haw!” turn commands when the lead dogs were coming up to the turn which was quite a while before I was coming up to the turn! But, what an amazing feeling! It was really magical. The snow falling, the dogs quietly trotting through the woods, the beauty of the scene…. I could see why people fall in love with dog sledding. Once we returned to the yard after our six mile or so run, we unhooked everyone and returned them to their houses in the yard. Then we went around and unharnessed everyone, knocked the ice out of their bowls again and gave them fresh water and food, scooped the poop again, and then finally got some “thank yous” and loving in! There are a few surprising Iditarod connections to Husky Powered Dog Sledding…. One of my wheel dogs, Bishop, is a Lance Mackey dog! Mike and his wife Linda have a wonderful story about bringing Bishop home. Apparently, while they were visiting Lance’s kennel, they decided to purchase the dog and they took him back to their hotel room until it was time to fly home. Bishop was mesmerized by the other dog in the room. He tried to sniff and nudge and paw at the other dog, but was never quite successful. That other dog you see was just his reflection in the mirror! I also had two of North Wapiti’s own Pretty Curly Tails on my team, Roary and Slider. North Wapiti is Iditarod racer, Karen Ramstead’s kennel in Canada. Roary is from the “Noise” litter and Slider is from the “Cell Phone” litter. So, while I still haven’t really felt what it is like to be behind a team of sixteen super charged Iditarod dogs racing down the trail, I had an amazing few days at Husky Powered and have even more of an appreciation for the amazing athletes that the mushers and especially the dogs are. It’s a lot of work, but the rewards are more than worth the effort.